Railpictures.ca - Bill Thomson Photo: Another one of the CN freights detouring over CP: CN SD75I 5651 and SD70I 5609 lead a westbound on CP’s Belleville Sub, as VIA trains 42 and 43 make their stops at the platform by the station. | Railpictures.ca – Canadian Railway Photography – photographie ferroviaire Canadienne. 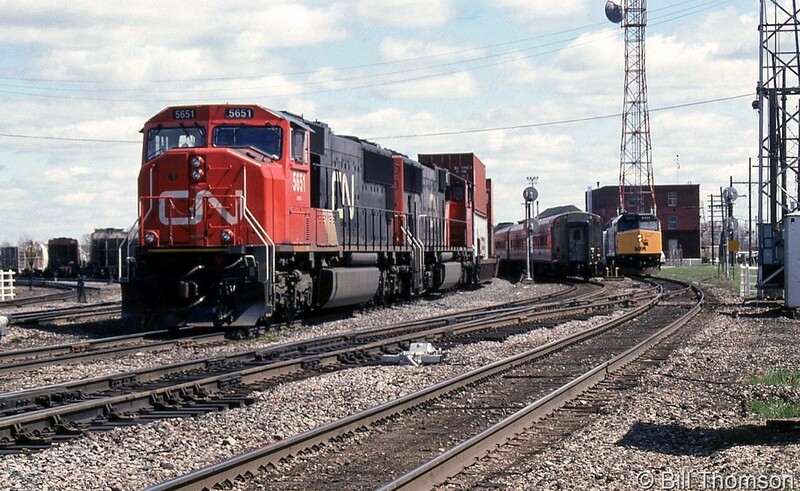 Caption: Another one of the CN freights detouring over CP: CN SD75I 5651 and SD70I 5609 lead a westbound on CP's Belleville Sub, as VIA trains 42 and 43 make their stops at the platform by the station.